It begins with a prologue in which a group of lawyers discuss a recent case at the Old Bailey. Mr Treves, a retired lawyer puts forward the idea that murder is not the beginning of a detective story, but the end, that murder is the culmination of causes and events that bring together certain people, converging towards a certain place and time, towards the Zero Hour – ‘towards zero’. The idea presupposes that there is an inevitability – that once events have been set in motion then the outcome is determined. The time, the place, the victim. … Yes everything planned – everyone’s reaction foretold and allowed for, the good and evil in everybody played upon and brought into harmony with one evil design. But the story begins with Angus MacWhirter recovering in hospital after a failed attempt at suicide, assured by a nurse that the mere fact of his existence could be of great importance, perhaps even save someone’s life one day. It then moves on to Superintendent Battle whose daughter has confessed to pilfering at school, even though she hadn’t stolen anything. The relevance of this episode is made clear later in the book. And it is only later in the book that the murder is carried out, giving plenty of time for all the characters to be introduced, defined and their thoughts and relationships explored – Nevile Strange, a sportsman, good looking, wealthy, married to his beautiful second wife, Kay, Audrey Strange, Nevile’s first wife, Thomas Royde, Audrey’s distant cousin returning from Malaya, who hopes to marry her, and Ted Latimer, Kay’s friend who all converge at Gull’s Point, a large country house on a cliff above the River Tern where Lady Tressilian and Mary Aldin, her cousin and companion live. ‘solid and durable, and in some way impressive. Superintendent Battle had never suggested brilliance; he was definitely not a brilliant man, but he had some other quality, difficult to define, that was nevertheless forceful. And as he also knows Poirot, he is able to apply Poirot’s use of psychology to the case, keeping the suspect talking until the truth slips out. 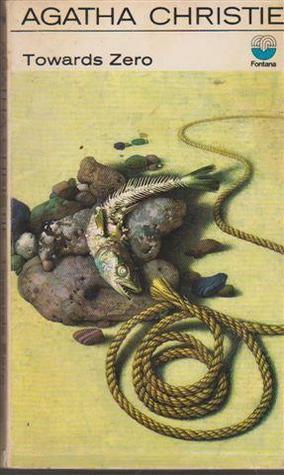 Towards Zero has to be one of my favourite of Agatha Christie’s books despite a few reservations – Angus MacWhirter’s role seems superfluous, other than introducing the idea of pre-destination, and Mr Treves’ story of a child killer wasn’t really explained. I was surprised by the ending – not the denouement of the murderer, but the unlikely romance between two of the characters in the very last chapter which seemed just too far removed from reality. But, disregarding these points I really enjoyed this book. I’m hoping to continue with my AC reading this year and this book that I’ve never heard of is a definite contender. Nice review. I hope you enjoy your AC books – they are a variable bunch, some much better than others. I’ve read so many Agatha Christie books through the years or listened to them on audio. I don’t think I’ve ever checked to see how many I’ve read. In any case, my favorites are usually Miss Marple and to a lesser extent, Poirot. That being said, I read a book of Christie plays years ago – can’t recall the name of it – had The Mousetrap and others. It seems to me that TOWARD ZERO was in it as the story sounds vaguely familiar. Perhaps I need to begin reading Christie again and focus on the books that don’t appear on my favorites list. Kay, it’s because of Kerrie’s AC Reading Challenge that I’ve read so many and kept a list of the books I’ve read. My copy of ‘The Mousetrap’ doesn’t include ‘Towards Zero’, but then you may have a different selection – mine has ‘And then there were none’, ‘Appointment with death’, The Hollow’ as well as ‘The mousetrap’. Margaret – It’s good to hear you enjoyed this as much as you did. Christie actually introduces that sort of ‘unlikely romance’ in a couple of her novels – interesting… But as you say, those minor things aside, I think it’s a great story too, and shows her plotting skills. Margot I can’t say I’ve noticed the ‘unlikely romance’ before, but this one took me so much by surprise that I couldn’t miss it! I haven’t read this one, I shall have to check the book shelf. Thanks, perfect way to start the new year.